Where Santa Claus Goes Shopping: The Mannheim Christmas Market is one of the largest and most beautiful Christmas markets in southwest Germany. 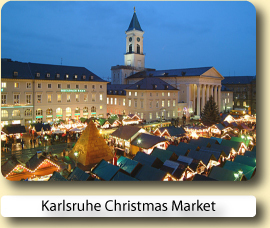 Many thousands of guests visit this Christmas Market every year. 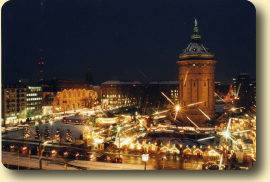 The Mannheim Christmas Market is situated in the centre of Mannheim, just five minutes walk from the central railway station. About 200 booths or more are placed around the "Wasserturm", a historic water reservoir and Mannheim's most famous landmark. 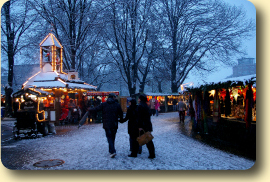 Surrounded by an expansive Art Nouveau garden, the Mannheim Christmas Market is a wonderful place to walk around with friends and family. It offers a great deal of ideas for Christmas gifts and decorations. Arts and crafts from many German regions and neighbouring countries are available to buy including a huge choice of toys, ceramics, candles, leather and Christmas decorations. Children will find great pleasure, riding the two antique merry-go-rounds, a children's train and a whole lot of other attractions. Regional choirs, schools, music and dance groups provide great daily performances and entertainment on stage. Thousands of lights and spicy scents create a warm and joyful Christmas atmosphere. 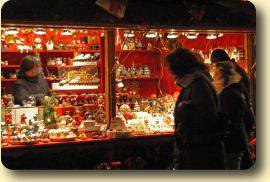 Typical German "Glühwein", Bratwurst and sweets will make your visit to the Mannheim Christmas Market an unforgettable experience. 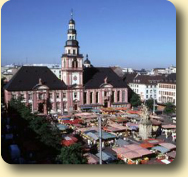 The lively city of Mannheim, with its beautiful squares, has many attractions which make the city well worth visiting. 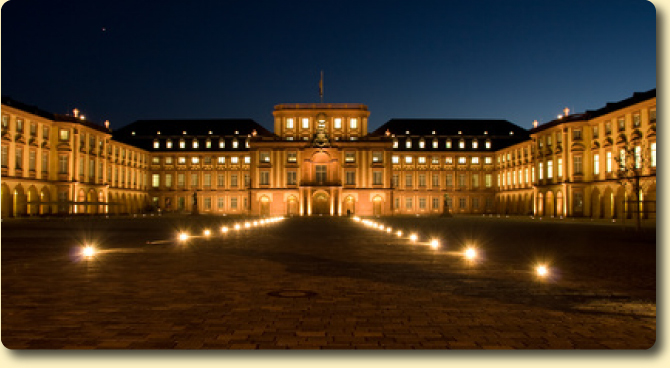 Mannheim is unusual among German cities in that its central area is laid out in a grid pattern much like many North American cities with the main route through the squares leading to an enormous 18th-century palace. The Mannheim Residence castle with its ornamental stucco knights' hall was built by Carl Philipp, it is the largest baroque castle in Germany. The palace lies directly beside a baroque Jesuit church with a high altar by Peter Anton Verschaffelt. This is the only church of this style in southwest Germany. The "Rose Garden" (Congress Center), which is one hundred years old and was built in the Art Nouveau style, forms a part of one of the most beautiful and largest Art Nouveau ensembles in Europe. 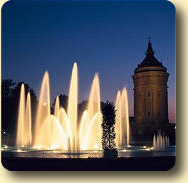 Mannheim's major landmark, the Water Tower, is also located there, surrounded by magnificent fountains. The Old Town Hall of the electors is situated on the Market Place (Markplatz), which plays host to the colourful hustle and bustle of the market three times a week. Adjacent to that in the centre of the city is Parade Square (Paradeplatz) with its Grupello Fountain. Mannheim's reputation as a parkland city is well deserved as it boasts many parks and gardens. Here you will have plenty of opportunity to enjoy the natural greenery around you. The Luisenpark, which is over a hundred years old, is situated immediately next to the Telecommunications Tower (Fernmeldeturm). Having been enlarged for the National Garden Festival in 1975, it is one of the most beautiful parks in Europe. Of the few streets among the Mannheim squares which have a name, the "Planks" must surely be the best known. In former times, wooden planks were laid on the ground between the Water Tower and Parade Square so as to allow well-to-do ladies to keep their feet dry as they strolled around. Nowadays the Planks are a pedestrian zone and, lined with elegant shops, cafés and shopping arcades, form Mannheim's busy shopping district. Located right beside the main shopping and leisure district, offers excellent service, excellent breakfasts, best value for money. Very convenient for overnight stay - across road from station. Room facilities excellent - newly refurbished with modern equipment. 15 mins walk from city center. Hotel is modern and comfortable. Staff are friendly and helpful! Everything is excellent! Mannheimer wasserturm and town centre is walking distance. The hotel is new, so the rooms are nice and modern. The size of rooms, furniture is also pleasing. 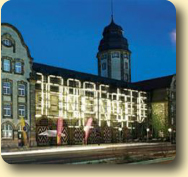 It is located in the walking distance of the main railway station. 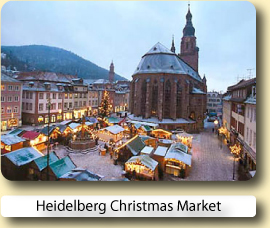 Book your hotel for the Mannheim Christmas Market with Expedia or Hotels.com.Both online reservation services will let you compare and book hotels at great low prices.